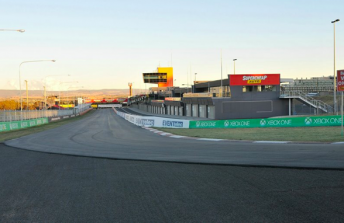 The resurfacing of Bathurst’s Mount Panorama Circuit is set to be completed this week ahead of February’s Liqui-Moly 12 Hour. The $2 million project, which was last undertaken in 2001, has been a work-in-progress since early November. It is part of a $6 million upgrade package of safety and infrastructure upgrades at the circuit that has also included a host of concrete wall and debris fencing alterations. The resurfacing itself has been done in four stages, starting with scraping 35mm off of the pre-existing asphalt. The cracks and entire circuit where then treated with a sealing spray prior to the new asphalt being laid down over the last fortnight. “We’re very happy with the progress,” said Simon Armitage, the manager of works at the Bathurst Regional Council. “All things going well we’ll have it finished this week. “We’ve tried to take out a few little humps and bumps where we could and the drivers will certainly notice that it’s a little bit grippier. Final line marking will occur in January before the February 7-9 12 Hour. The new surface is expected to provide record lap speeds for all classes competing at the venue. Jason Bright will race in both the 12 Hour, which has lifted its previous qualifying time minimum this year, and October’s Bathurst 1000. The 1998 Bathurst 1000 winner expects record lap times to dominate the pre-race build-up for both events. “It’ll obviously be a big change for all of us because it hasn’t been resurfaced in so long,” said Bright. “The surface has deteriorated a little bit and whenever we see a new a surface go down on any track it means faster lap times. With the MotoGP world championship’s troubles at Phillip Island a recent reminder of the tyre issues that can arise from a resurface, Bright says that control V8 Supercar supplier Dunlop will need to again be prepared for the change. “It’s definitely possible (to have problems caused by the new surface), but we’ve had tyre problems at Bathurst even on the old surface,” he said.